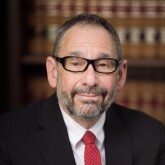 Mr. Shapiro has practiced law with the firm since 1984 and has been a partner since 1987. He formerly served as a Hearing Officer and Staff Counsel at the Massachusetts Labor Relations Commission from 1981 to 1984. Like all of the firm’s attorneys, his practice concentrates in the representation of labor unions and their members. A graduate of the Roxbury Latin School (1969), Harvard College (1973), University of Massachusetts, Boston (MA English 1977) and Emory University School of Law (1980), Mr. Shapiro has taught courses at The Labor Guild and participated in numerous seminars sponsored by the Massachusetts and Boston Bar Associations and Massachusetts Continuing Legal Education, Inc. He has argued cases before the Massachusetts Supreme Judicial Court, Appeals Court, and First Circuit Court of Appeals. When not practicing law, Mr. Shapiro avidly bicycles both long distances on weekends and to and from work, weather permitting. He also plays a fairly mean game of pool. He lives in Jamaica Plain with his wife, Marie Lee, Esq.